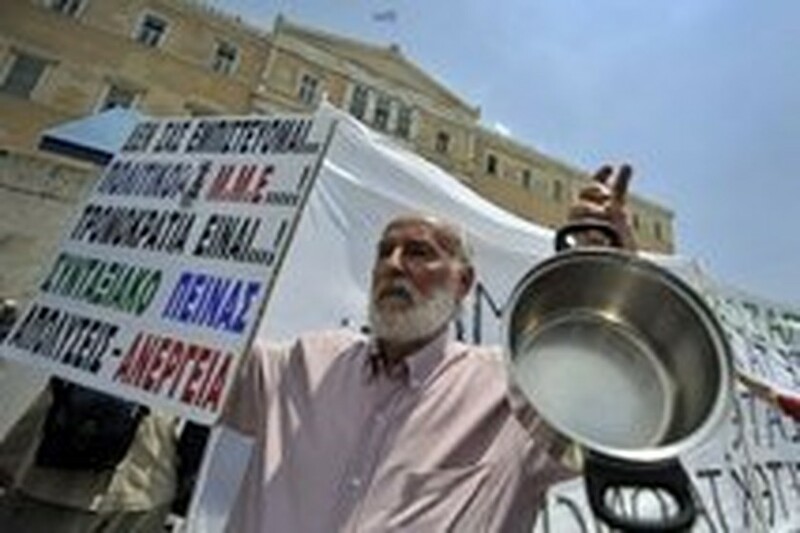 ATHENS (AFP) – Greece faced a general strike Thursday after deputies approved a bill on the reform of the private-sector pension system, voting to raise the retirement age from 60 to 65. Socialist deputies and two independents late Wednesday backed the measure, considered a key plank of the government's programme adopted in May to pull the country out of its financial crisis. The move was opposed by right-wing and far-left parties, including the communists. The new measure also requires 40 years of payments into the pension fund instead of 37 years previously. After Wednesday's vote in principle, the bill was to be debated article by article before a second vote on the entire package late Thursday, parliament's speaker Philippos Petsalnikos said. Prime Minister George Papandreou stressed the importance of the measure, arguing it was vital for the viability of the current pensions system and to ensuring its future. A second bill proposing the same retirement age for public sector workers has been scheduled for a parliamentary vote next week, Finance Minister George Papaconstantinou told a parliamentary committee earlier Wednesday. Both public and private-sector unions have denounced the plans, and have called a general strike and protests for Thursday. Dozens of flights through Greece will be disrupted by the strike that will also paralyse other forms of transport and public services, officials said. Greece's main flight operators Olympic Air and Aegean will ground 34 flights and reschedule another 45, including to several international destinations, the companies said. A four-hour work stoppage from 0700 GMT by air traffic controllers will also affect other carriers. "Nothing will fly during that four-hour period," a spokeswoman at Athens International Airport told AFP. Ports will be closed, trains will be halted and urban transport in Athens will come to a standstill from the labour mobilisation which will also shut down banks, post offices and public services. Hospitals will operate solely for emergencies and no news broadcasts will be made as journalists have joined the action. The strike is the sixth this year against a broad austerity policy imposed by the Socialist government as it struggles to deal with a debt crisis that pushed the country to the brink of insolvency in May. The pensions reform was one of the measures required by the eurozone countries and the International Monetary Fund in return for the 110-billion-euro rescue package for Greece that was agreed in May. "The pensions system was going to break down... costs for all pensions currently represent 13.5 percent of gross domestic product, and without our intervention they would have reached 26 percent of GDP, which would be catastrophic for the economy," Papandreou said. Employment Minister Andreas Loverdos declared that the reform would help Greece "to return to the way of development and prosperity, in a national consensus to save the country."